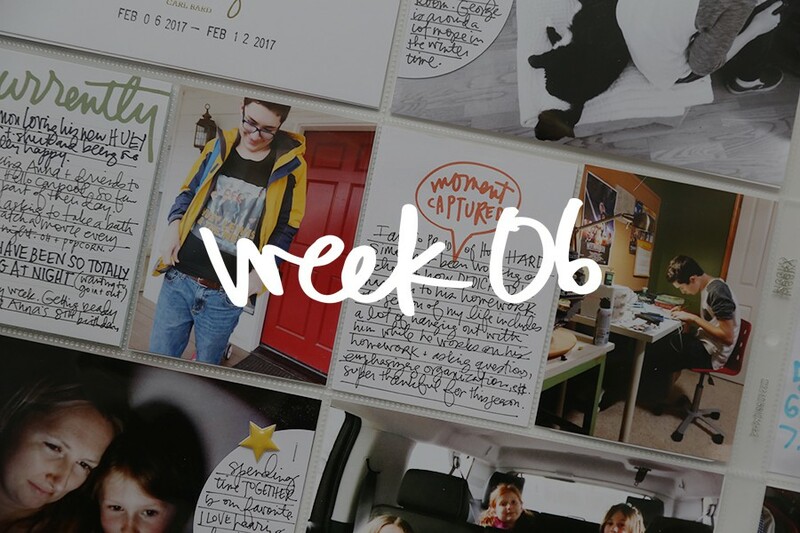 Welcome to Project Life® 2016 | Week Two. Just a heads up that my online Storytelling With Project Life® workshop begins next Tuesday - February 2nd (registration will close on February 9th). I've been spending a lot of time recently going back through all my past albums gathering story ideas and assessing what's worked and not worked and what I've learned along the way. It's been awesome to go back and see what this project looked like for me in the beginning vs. today (the things that are the same & different). I'm excited to share another in-depth workshop with you as we all figure out our own heart of the matter with Project Life®. Get all the details here. Another insert this week. I don't do this every week, it really just depends on what's happening and what I might want to include. These two drawings from Anna were ones that I didn't want to cut up. So great Anna. This is one of the things I love about Project Life® - it can be a home for this kind of stuff. Not all of it of course, but added in here and there it makes the whole thing come to life that much more. The "heart this" in the speech bubble card is included in my Love Life Journal Card Set. Ah yes. The Mega Date Stamp. It's giant and it's awesome and I think I'm likely to use it a lot this year. I got one when they first came out last year and ended up giving it to my sister because I'm nice like that. When they became available again a couple of weeks ago I jumped at the chance to order one for myself. Super happy with that purchase. The cute little chipboard heart is from Freckled Fawn's Iconic embellishment kit. The "tell it like it is" card was created using a stamp from my Stories stamp set and a journal card from my New Year set. "Currently" is a journal card that can be found in the This and That set. Lots of handwriting on journal cards this week - it's such a simple and easy way to document. And Powerball, of course. And of course #notawinner. One of the things I've loved as I've looked back through all my older albums is the inclusion of ephemera and random papers like that - I want to keep being intentional about including those kinds of things. The "magical ordinary moments" chipboard circle was included in the SC Wink Wink Scrapbook Kit. One of my favorite recent photos of Anna is this one I took of her with an iPad in her lap before bed. The fun little sticky note on top was from a Freckled Fawn embellishment kit. I used the black vellum alpha and cork number from SC's Arendal Kit to create the "dinner" journal card (on top of white cardstock). And you gotta love that photo of Simon. The red "bring on the awesome" was cut from a 4x6 inch card in the Cheer Story Kit™. On top of the photo of Anna I used the "go ______ go" stamp from the Cheer Story Stamp™ set and placed one of the vellum alpha stickers right in the middle. Love creating little homes for embellishments like that. I'll be talking about that in the class :). Excellent! Thank you Ali! Im really looking forward to the class! 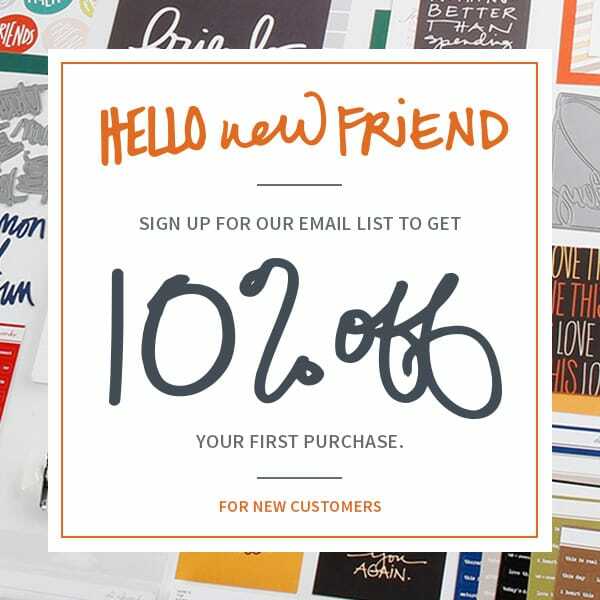 Ali-when you include ephemera like receipts, do you copy them? I have kept things like that to scrap and have found they fade away. Especially things like receipts that are thermal printed. Any suggestions for that problem? I don't. I've read about the fading of some receipts but haven't seen that with the ones I've included. You could definitely copy them or take a photo if you wanted to avoid the fading potential. Good point! I have a bunch of receipts I kept when we were in Italy 2 years ago and most of the ink has rubbed off! The photo of Simon was the first thing I noticed and I instantly laughed! Great spread! I am hoping to start some kind of PL this weekend. Not sure if it will be weekly or monthly though. I am taking your class and I'm sure I will be inspired by it, as always! Love this - a treat to read while I drink my tea this morning! I'm signed up and looking forward to the class. I have never done project life and my family is getting sick of my everyday photos (I get a lot of eye rolls and "what are you taking a photo of?" My husband thinks social media and selfies etc. are very narcissistic) but I signed up for the class - partly because I can't resist your classes Ali & love every one I've taken and partly because I'm hoping I can get these photos and my older ones into albums to document the memories. My kids are 13 and 16 and I hate that they'll be off on their own soon enough and I'll forget all these daily moments - even though most every day is so similar with hockey practice and my daughter's activities and me collapsing at the end of the day. :) I'm also hoping that I'll be able to get some of those older photos into albums and not be too concerned that I don't remember the details and the stories from when they were taken. I love seeing your PL spreads!! So much inspiration!! I'm signed up for the class and I am so excited to start it. Are you going to be offering the New Year journal card set as a digital purchase? Checking on the timeline for those cards to be offered digitally. I'm so inspired to keep up and be creative with my PL when I see your layouts - SO GLAD I subscribed to the story stamps/kits. Question - what is the Stitch Fix you mention in the top left? Love the pants! Yes - checking on the timeline for those with Katie. I love including kid art in PL, but there is SO much of it!! I try to pare it down a lot but still end up with quite a bit that I can't part with. If I include it all in PL I'll have 4 albums a year which is more than I think is reasonable, what do you do with the rest? Some of it I keep in a tub - some means a few. Most I just recycle because there is just so much :). Tealmyre, I have two daughters (11 & 13) and have accumulated TONS of art work over the years! I had a hard time throwing ANY of it away! Finally I decided to take pictures of it all and made each of them a photo book of their work. It was a big project, but so worth it! Ali, how do you organize your PL cards/stamps/embellishments? Hi! I'll be talking in more detail about this in my Storytelling With Project Life® workshop. Generally I organize in small boxes by style and/or brand. I've made a really conscious effort to have less supplies so I don't have to think about how I'm going to store it all :). I like having fewer choices! Stamps are in a small container and/or an album with pocket pages (working on getting that organized now). Baskets and bins are my go-to for most things. Hi! Sounds like they should be in the shop mid-February. Love Simon's face. Made me laugh, as usual! He's good to make some faces, isn't he? Lovely!!! I sure hope SC will bring back that mega date stamp!! A days of the week mega rolling stamp would be pretty awesome too! I hope so too! Pretty sure they were still in stock when I was writing this post. wowzers! two layouts in one week! Thanks Ali!! Want. That. Page. In. My. Book. Am so looking forward to next Tuesday!!!!! OMGoodness. That face that Simon is making -- totally a face you would make! Love. It. Also, I need the mega date stamp. I just also want to say that I love your PL posts. 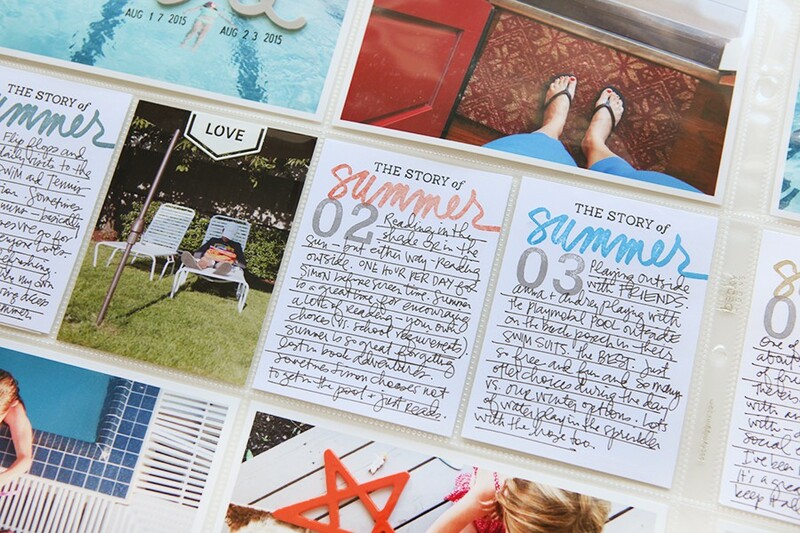 You kind of got away from posting these, but they are so real and full of reminders of little stories and pictures, as well as ways to use supplies differently (like cutting up our PL cards). Anyway, just hope that these positive responses will encourage you to keep posting these! I love love love your pages! 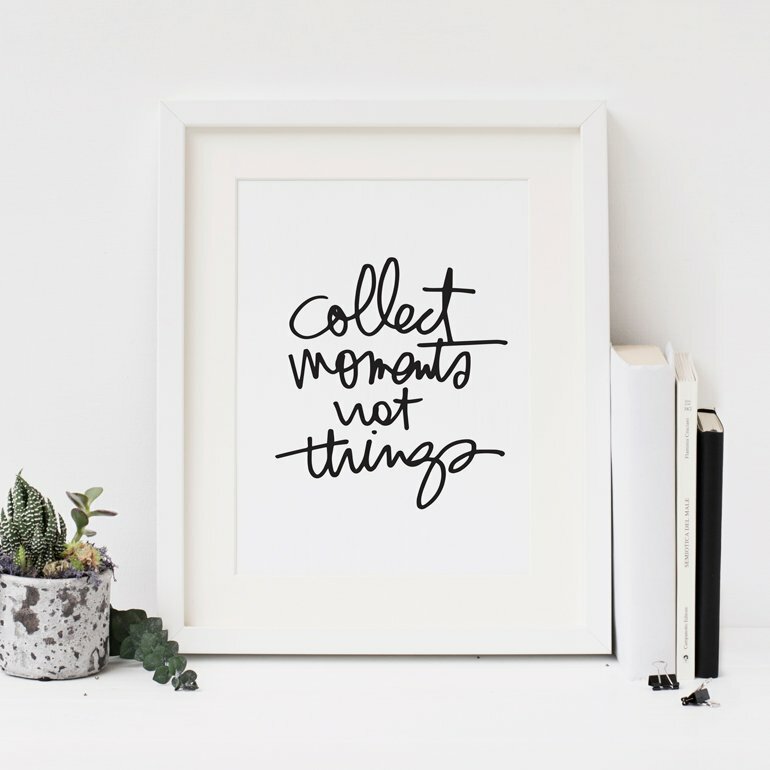 the mix of journaling, pictures of you, your home, your kids and the little add bits is perfection! I can't wait to learn more in the Storytelling with PL class!